Are you a print-media designer who works in Adobe Indesign on MacOSX? Do you handle a lot of agency photos on a regular basis? IPTCViewer will save time and energy for you. 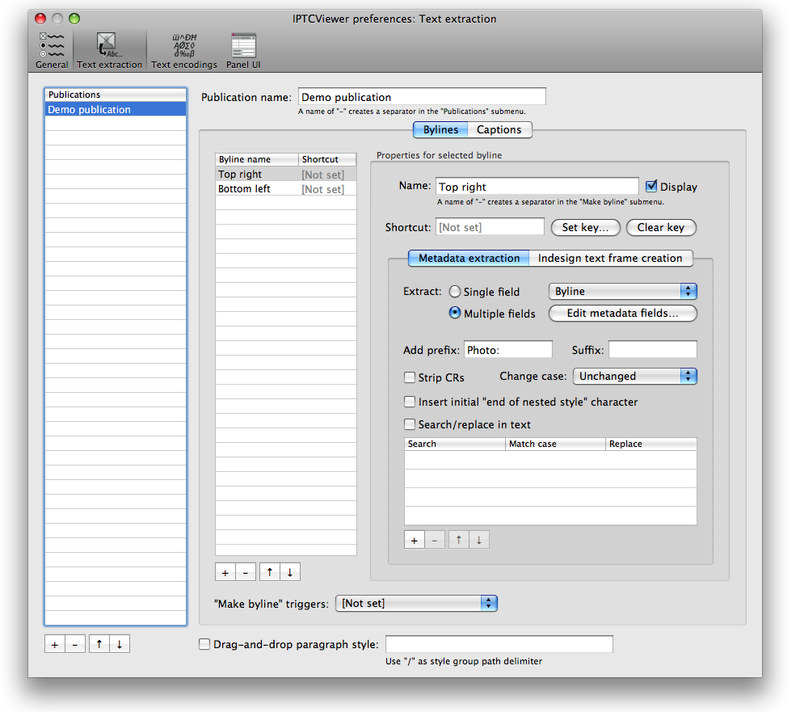 Simple: Select an image in Indesign: its metadata is displayed in IPTCViewer's panel. Create bylines automatically: Stop fiddling with byline text frames. IPTCViewer does it for you at the touch of a key. 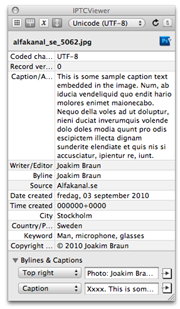 Advanced options: Extract and assemble text from partial or entire multiple metadata fields. Add arbitrary text. Search and replace garbage data. Multiple image formats: IPTCViewer reads image metadata in JPEG, TIFF, AI/PDF/EPS and native Photoshop files. 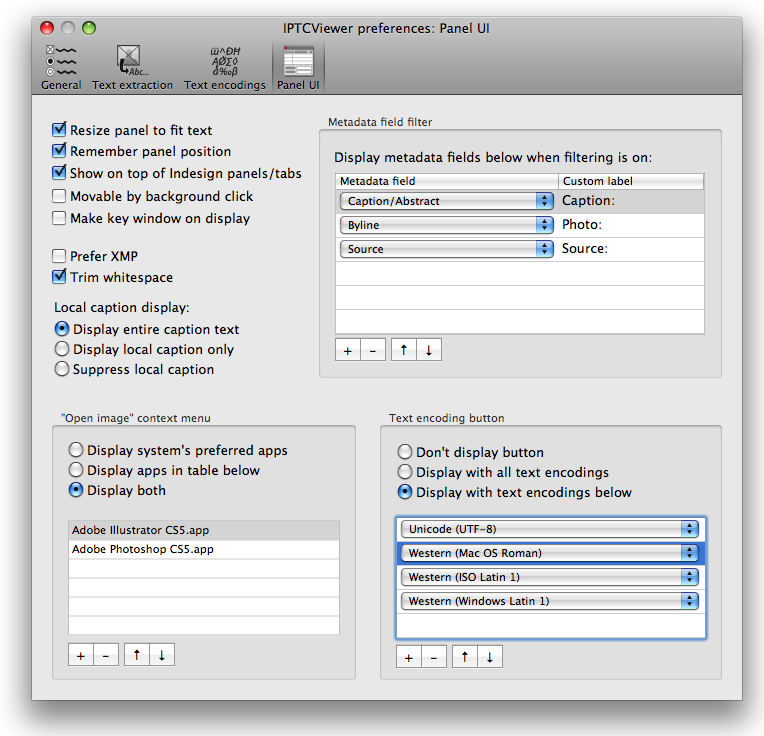 Preferences panel 1: Adapt IPTCViewer to your needs. Preferences panel 2: Create photo bylines in Indesign at the touch of a button. 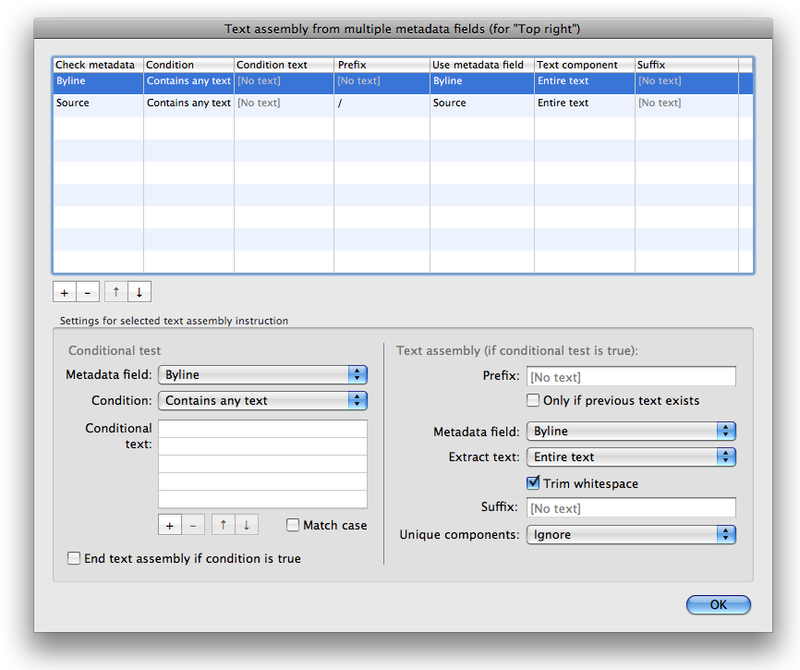 Assemble text: Advanced text assembly editor for constructing byline text from multiple metadata fields. 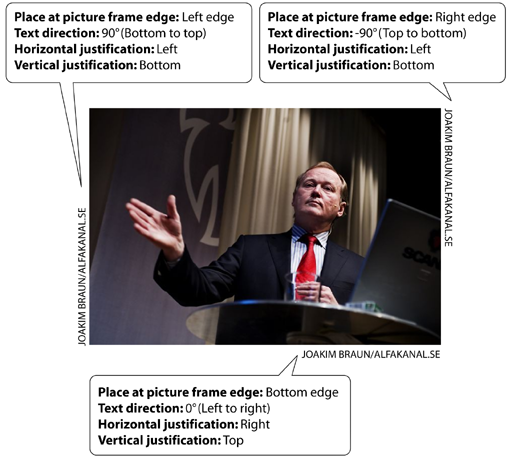 Create text frames: Place byline frames at arbitrary distance from image frame, with arbitrary text direction. Preferences panel 4: Lots of fine-tuning possibilities. System requirements: Should work with MacOSX 10.3 and newer, and Indesign versions from CS3 up to at least CS5. Pricing: Registration is 30 EUR (on a single computer or for a single physical user). Please inquire about workgroup licenses. The unregistered version is free. 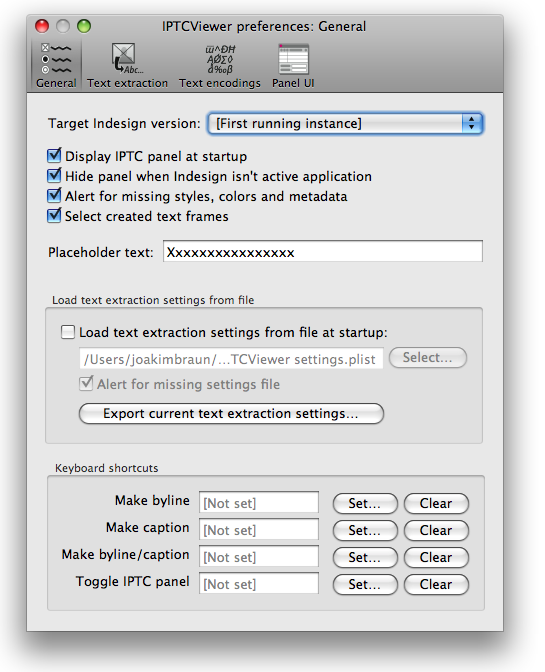 It's identical to the full version, except that it appends the text "IPTCViewer" to all bylines and captions created in Indesign. Fixed error handling for missing and unparseable files. Some changes to the parsing engine. Fixed some cosmetic user interface glitches in the English version. Fixed endianness issues to make IPTCViewer work on Intel Macs. Revamped text instruction editor interface. Fixed various image parsing, stability and Cocoa Bindings bugs. Payment by PayPal to account joakim.braun@jfbraun.com. Use button below! Major credit cards accepted. Upon receipt of payment, you will receive a registration confirmation with a serial number and further instructions within 24 hours. Registered version users are entitled to 2 years of free updates (starting on the registration date). Upgrade by downloading the current IPTCViewer version here.